Last week, we helped you plan for the best Thanksgiving dinner in Dripping Springs. Now that we have the food covered, it’s time to think about your Turkey Day decorations. Here are some of the top Thanksgiving décor trends to incorporate into your Caliterra home this year, and the best part is that you can do them all yourself! Starting off our list is one of our favorite Thanksgiving decoration ideas. The gratitude tree is a simple and special decoration piece. 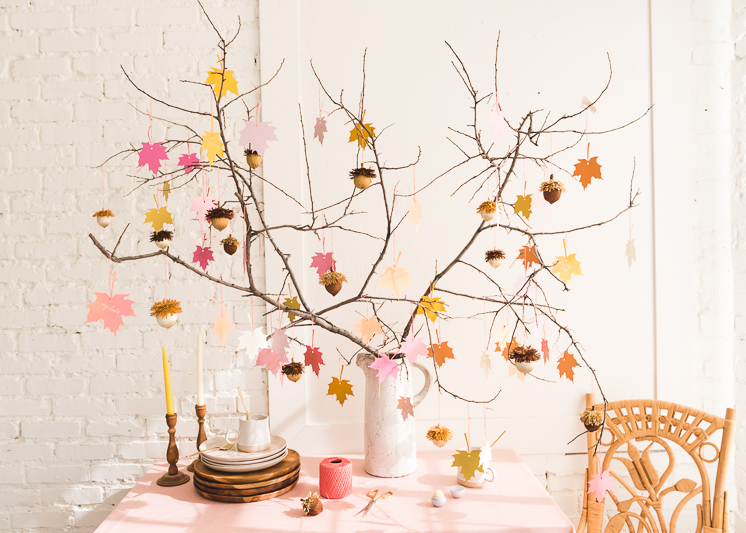 Put a few branches in a vase and then have leaf cutouts where your guests can write what they’re thankful for and then hang it on the tree. This specific version also has a fun add-on of acorn favors. Here are the instructions to do it yourself. If you like having candles as part of your fall décor, then these candle wreaths can help to add a little extra Thanksgiving flare. Here are the instructions so that you can get crafty and make this fun decoration yourself! Are you looking for a fun way to tell people what’s on the Thanksgiving “menu” or some other message? You could do a boring old chalkboard, OR you could make chalkboard pumpkins! This has to be one of the more easier Thanksgiving décor trends because all it takes is painting pumpkins (real or fake) with chalkboard paint, and then you’re good to go. Rounding out our list is the perfect Thanksgiving decoration to welcome all of your guests into your Caliterra home. A pine cone door hanger is a simple but elegant outdoor decoration that gets your guests into the fall-iday spirit. Here are the super simple, 3-step instructions. These are just some of our favorite Thanksgiving décor trends, but we’d love to know how you plan on decorating your Caliterra home for the holiday. Connect with Caliterra Living on Facebook, Instagram and Twitter to tell us how you and your family celebrate Thanksgiving in Dripping Springs!